Achilles tendonitis is a common condition that causes pain along the back of the leg near the heel. The Achilles tendon is the largest tendon in the body. It connects your calf muscles to your heel bone and is used when you walk, run, and jump. It is also prone to inflammation associated with overuse and degeneration. Tendonitis is inflammation of a tendon. Inflammation is the body's natural response to injury or disease, and often causes swelling, pain, or irritation. There are two types of Achilles tendonitis, based upon which part of the tendon is inflamed. In non-insertional Achilles tendonitis, fibers in the middle portion of the tendon have begun to break down with tiny tears (degenerate), swell, and thicken. Tendonitis of the middle portion of the tendon more commonly affects younger, active people. Insertional Achilles tendonitis involves the lower portion of the heel, where the tendon attaches (inserts) to the heel bone. In both non-insertional and insertional Achilles tendonitis, damaged tendon fibers may also calcify (harden). Bone spurs (extra bone growth) often form with insertional Achilles tendonitis. *A bone spur that has developed where the tendon attaches to the heel bone. •Limited range of motion in your ankle—specifically, a decreased ability to flex your footIf you have experienced a sudden "pop" in the back of your calf or heel, you may have ruptured (torn) your Achilles tendon. See your doctor immediately if you think you may have torn your tendon. Your doctor may order imaging tests to make sure your symptoms are caused by Achilles tendonitis. X-ray tests provide clear images of bones. X-rays can show whether the lower part of the Achilles tendon has calcified, or become hardened. This calcification indicates insertional Achilles tendonitis. In cases of severe noninsertional Achilles tendonitis, there can be calcification in the middle portion of the tendon, as well. Although magnetic resonance imaging (MRI) is not necessary to diagnose Achilles tendonitis, it is important for planning surgery. An MRI scan can show how severe the damage is in the tendon. If surgery is needed, your doctor will select the procedure based on the amount of tendon damage. The Class IV K-Laser is at the heart of our treatment program. It provides a safe, effective, non-invasive, painless solution for achilles tendon pain and injury. Patients respond exceptionally well to treatments and usually notice significant pain relief after just a few treatments. Dr. Berry’s program utilizes the latest FDA Cleared Lasers, and combines them with other therapies to help reduce the pain, strengthen the muscles and increase range of motion. Most importantly these treatments help reduce inflammation/swelling, which helps improve overall function. 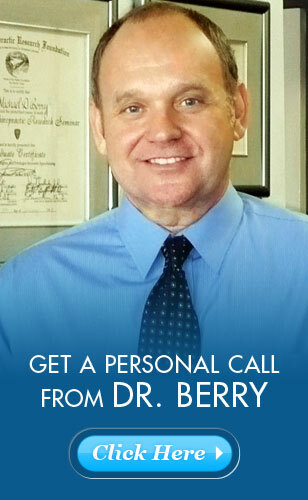 Dr. Berry has been treating sports injuries for over 35 years and has been helping people suffering from various health conditions during that time. Patients seek his advice and care if they want to avoid surgery if at all possible and help you return to all the activities you enjoy..